This artist’s impression shows the first interstellar asteroid, `Oumuamua. An asteroid that visited us from interstellar space is one of the most elongated cosmic objects known to science, a study has shown. Discovered on 19 October 2017, the object’s speed and trajectory strongly suggested it originated in a planetary system around another star. 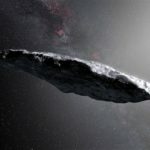 Astronomers have been scrambling to observe the unique space rock, known as ‘Oumuamua (pronounced oh MOO-uh MOO-uh), before it fades from view. The asteroid’s name, ‘Oumuamua, means “a messenger from afar arriving first” in Hawaiian. The International Astronomical Union (IAU) also approved an official scientific designation for ‘Oumuamua: 1I/2017 U1. Find out more about this amazing asteroid in this BBC News article!